These perfumes were sent free from Nui Cobalt Designs in exchange for an honest review. 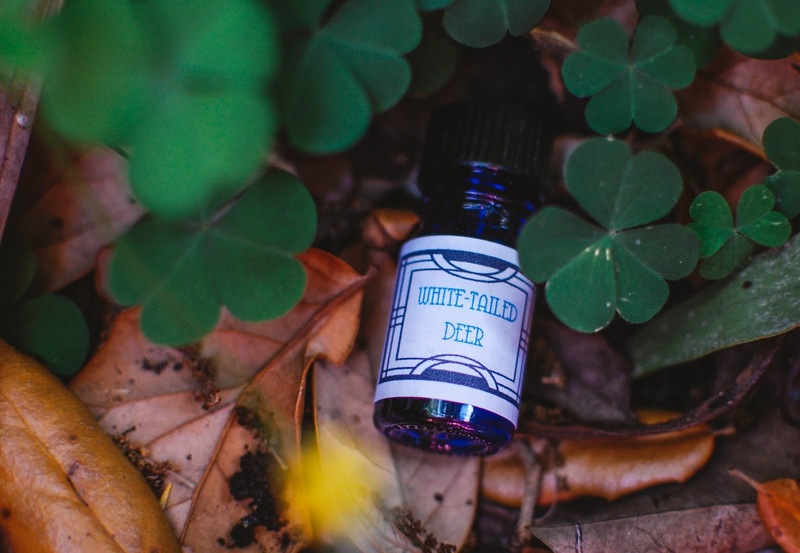 Forest, the perfumer and artist behind Nui Cobalt Design, recently released a March Collection that is inspired by many of the denizens of spring. Each of these perfume oils cost $19. 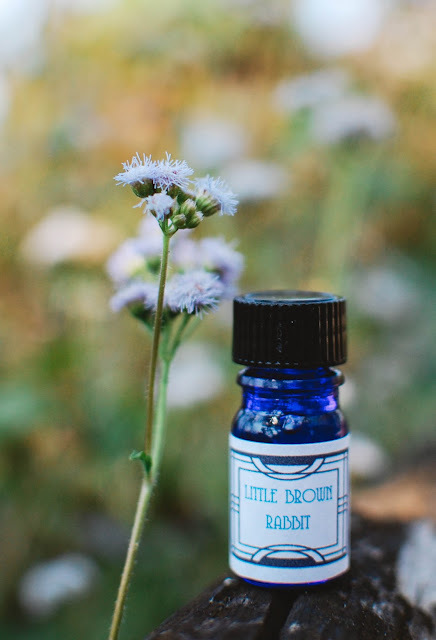 Little Brown Rabbit- A blend for abundance. Notes: Nutmeg, tonka bean, fluffy marshmallow, cotton flower, pink pepper and carrot seed. Fresh and fluffy cotton bolls push out of the blue vial like clouds scudding across the sky. There is a pillowy sweetness that is imparted by the marshmallows. Once caressed onto the skin, the cotton bolls meld with a fuzzy vanilla that is shaded with the fragrant tones of tonka beans and coconut. A truly beautiful fragrance that speaks of dew drops on meadow flowers, sunlight glinting through ferns and gentle breezes ruffling sable fur. It is as refreshing as a spring frolic could possibly be. If you were ever a fan of Bath and Body Works Sea Island Cotton, you would fall head over heels for this much more beautiful and exquisitely rendered version of the cotton flower. Robin's Egg- A gentle and protective blend. Notes: Forget-me-nots, lily of the valley, whipped blueberry creme and a cozy birch nest tucked into a flowering dogwood tree. The cobalt glass cups blueberry and cream hard candies that float on a background of cool toned florals. However, graced on the skin, the perfume opens with the tiny waxy bells of the lily of the valley and miniature blue forget-me-nots. Their musky florescence emits the merest whisper of paperwhites and lilies. Gradually the flowers are sweetened with homemade vanilla blueberry hard candies, but only around the edges. Sage green hued florals and the almost wintergreen and anise facets of birch wood hatch to reveal the drydown. 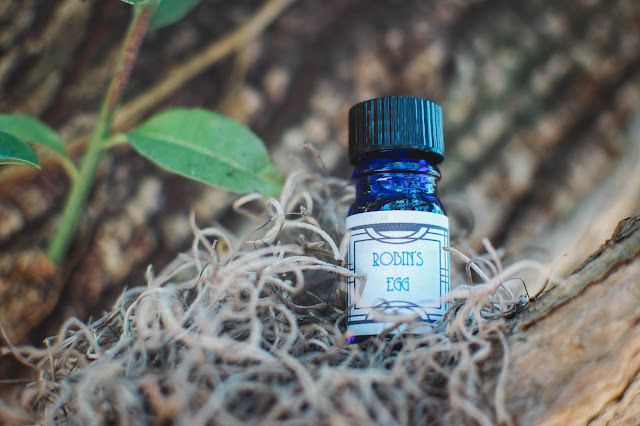 This is a sweet and speckled beauty of a fruity-floral aroma in those gorgeous Robin's egg blues, complex and dainty. 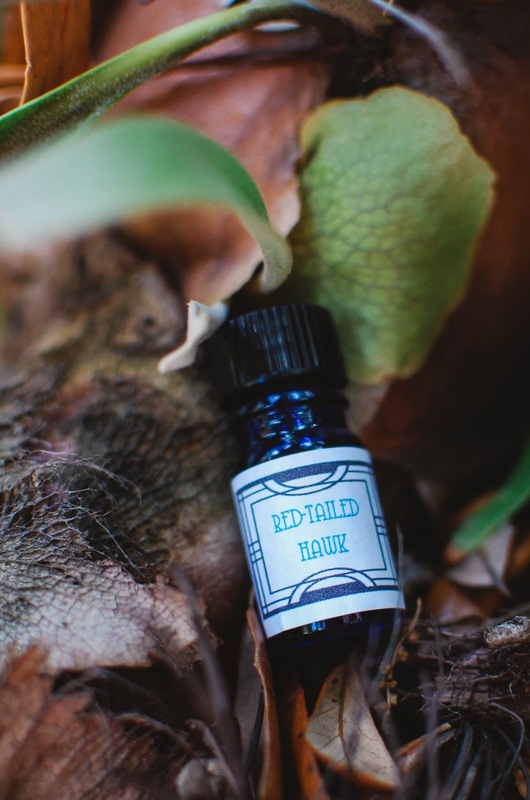 Red-Tailed Hawk- A blend for wisdom. Notes: Cedar, spruce, cinnamon bark, pimento, sandalwood and lemon verbena. Brightly radiant spice that is as warm and luminous as the sun sparks off the tops of woodland trees. This is the scent that rises from the bottle. Glossed on the wrists, candied spice, that is brightened and lifted by lemony verbena, soars about the senses. There is a joyful rootbeer-sarsaparilla effervesce accord that is created with the notes somehow. The effect is sweet, bubbly and spiced woods. Light and buoyant like the cinnamon stained hawk framed by a lemony sun. The honeyed cedar and sandalwood glow with the last embers of spice in the drydown. This glorious fragrance lifts the mood and yet still creates a comforting and snuggly feeling. This is a sweetly spiced woods perfume that is perfect for wearing all year, even during the summertime, given its airiness. 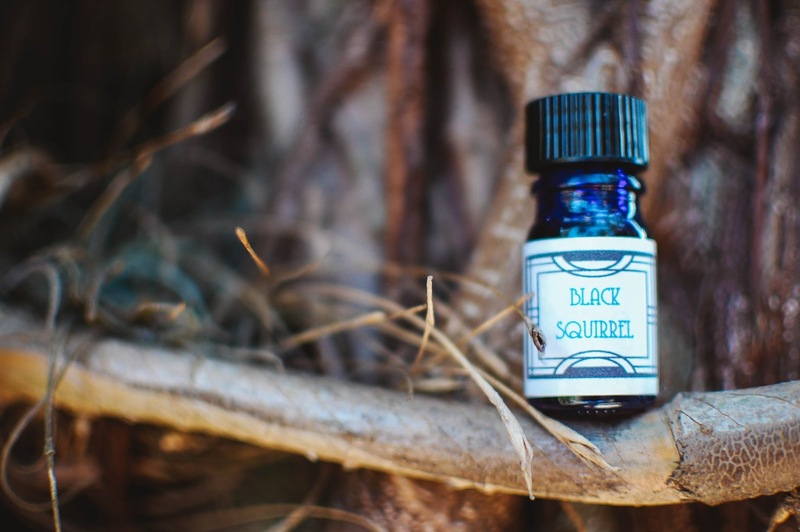 Black Squirrel- Notes: Almond, spiced apricot, rich benzoin, copaiba balsam, black oak, black currant, vanilla bean and myrrh. From the bottle warily creeps a dark and sweet scent, dulcet almond and black furry benzoin resin that possesses tonka bean nuances. These notes form the ebony pelt of the squirrel, furred and mellifluent. Dabbed onto the wrists, almond and apricot emerge first. Dried and chewy apricots embedded into an almond pastry. However this is not quite overly gourmand, as wooden notes of tea hover in the background lending a perfumed musk. The tea gets stronger until it fills the senses and you realize you are sipping a cup of apricot and currant tea while observing the squirrels scamper about in the oak tree in the backyard. The dried currants bob in the tannic waters, lending their characteristic tartness. As the scent burrows in and dries down, these become the apricots and currants the squirrel has tucked away in her nest for the winter. They smell of the secret dusky resinous hearts of trees, the mysterious places of the forest. I love the dark dusty earthy tones of the woods and resins in this one. White-Tailed Deer- A blend for peace. Notes: Soft brown suede, golden musk, wild forest berries and roasted chestnuts dusted with maple sugar. The aroma of nutty maple candies and buttery leather waft up from the bottle. Once on the skin, a gorgeous tawny suede unfolds. It is light and airy, supple and velvety. The golden musk lends the aura of lightness and rests like a halo over the skin. As the suede melts into the flesh, nuances of dusty chestnuts and the thin delicate skins of berries add dimension to the soft worn leather. This is the quiet scene of a spotted fawn cupped into a hollow of underbrush with her luminous obsidian eyes, ever watchful. Bits of berries and nuts peek around her knobby knees that are folded close to her downy body. A tranquil perfume to bring peaceful feelings. This might quite possibly be my new favorite leather scent. I love how golden and light it feels. Copper Fox- A blend for wit and resourcefulness. Notes: Warm chai with steamed almond milk, cashmere, crimson musk, sarsaparilla and budding birch. 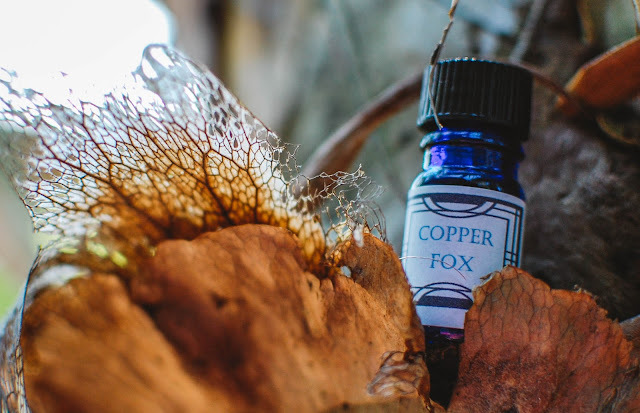 Copper Fox lifts up in a melange of peppery and anise filled chai paired with wintergreen tinged birchbeer. This sly fox does not lose any intensity when rubbed into the skin either. The pepper, nutmeg and anise swirl in the black tea hued pools of the fox's eye. An intense scent for an intense gaze. The orange and browns and reds of his handsome fur speak of russet spices blended with musk. Just as inviting and silken in its scent as his coat is. I love all of these wonderful perfumes but my heart belongs to Little Brown Rabbit, Red-Tailed Hawk, White-Tailed Deer and Black Squirrel. Which animal do you think you would gravitate towards? I am so sorry to hear about your pup. My heart breaks for you. I know she had a beautiful life with you. May your heart mend and you know that I am thinking about you.